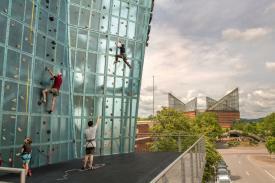 Outdoor activities dominate our local guide to Chattanooga, Tenn., and why not, when the city is home to so much natural beauty right in the heart of the United States? A friendly city with tons to explore, it’s worth a visit — but before you go, pack these essentials to make the most of your trip. We’ve shared packing essentials for any 36-hour trip in previous lists, so we asked Colleen Creamer, who wrote our guide to Chattanooga, to name a few items she was glad to have on her last visit — or wished she had packed. Then we turned to Ria Misra, an editor at Wirecutter, for the best products to fill those needs as well as her expert suggestions for other things to pack to make the most of your trip. Here are their picks. Rugged camera for outdoor adventures. “If you plan to be hang gliding off Lookout Mountain or zip lining in the area, you may want to commit those memories to something more reliable than memory,” said Ms. Creamer. In that case, Ms. Misra suggested the GoPro Hero6 Black, a tough, waterproof action camera with plenty of mounting options. Even better are the crisp still images it takes and how easy it is to use. It takes pretty good video, too, so you can share those soaring views with your friends back home. Bike-friendly daypack. Chattanooga’s waterfront is a lovely place for a bike ride, and it’s conveniently populated with bike stations for the city’s rental program. Before you head out, grab the Thule Paramount 24L daypack. It fits comfortably on your back both on or off a bike, and has plenty of space for water, snacks and more while you pedal around town. Ms. Misra especially likes the pack’s roll-top enclosure, which you can either unroll for extra space or roll down to keep your belongings dry in case of rain. If you do plan to take a bike trip, Ms. Misra also reminded us not to forget to bring a helmet. Giro’s Savant helmet is slimmer than most, if you’re trying to conserve space, and it still fits great. All-weather kit. “Chattanooga has four seasons, and all of them can be moody. Summers can be hot and humid, winters can run from below freezing to just breezy and most restaurant/bars have outdoor seating with and without heaters,” Ms. Creamer said. Patagonia’s Torrentshell Jacket, which we’ve recommended in previous guides, packs down small when not in use, layers easily over your clothes and has an ample hood that’ll keep your face dry from any rain. When the sun comes out again, Ms. Misra recommended a good sunscreen, bug repellent to protect you from mosquitoes and sunglasses. These Kent Wang shades are polarized, stylish and durable — Ms. Misra noted that her pair still looks great even after months of being tossed around in the bottom of her bag. Hiking shoes. Finally, Ms. Creamer suggested you bring a shoe or hiking boot suited for the outdoors. “Chattanooga is known for its scenic, hilly terrain, hiking trails and a riverfront meant for walking,” she said. A trail runner, like the Saucony Peregrine 7, has grippy traction but still gives you the comfort of an athletic shoe. If you prefer a hiking boot, Ms. Misra also likes Salomon’s Quest 4D 2 GTX. They look (and are!) rugged, but they are also one of the lightest boots Wirecutter experts tested, and it felt great even on more casual day hikes.